When I have the time, there is nothing I love more than a good read. Curling up with a book and a cup of soothing cup of tea - Mariage Freres being a tipple of choice but equally a good camomile tea would also be a treat. Books of choice at the moment are from the incredibly talented writer Angela M Saunders. At first glance the covers are super sophisticated, pretty colours and glamorous fonts. 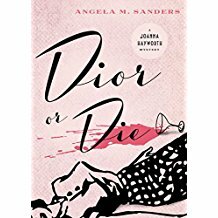 The stories are interesting on their own merit as great thrillers and then there is the added bonus of huge amounts of vintage clothing and fashion designer interest and facts. For anyone who's look a good 'who done-it' and had an interest in vintage and retro clothing - these are for you.